In 2015–16, sweetpotato production was valued at $80 million (LVP). Sweetpotatoes are available all year round in Australia with total production of around 100,000 tonnes. There are around 90 commercial producers with farm sizes ranging from 10 to 200 hectares, with most in the 15–80 hectare range. Queensland is the biggest producer with over 87 per cent of production, centred mainly in Bundaberg. The second major production area is around Cudgen in northern NSW. Sweet potatoes are also grown in Mareeba, Atherton and Rockhampton in Queensland; Murwillumbah in NSW; and Perth, Carnarvon and Kununurra in WA. 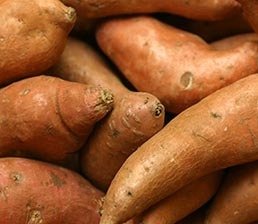 Four types of sweetpotato are grown in Australia, categorised by skin and flesh colour. The gold variety (rose-gold skin, gold flesh) dominates the Australian industry with over 90 per cent of production. Red category (red skin, white flesh) makes up around eight per cent, with purple (white skin, purple flesh) and white category (white skin, white flesh) making up the remainder. The majority of production is consumed domestically with under one per cent exported. Commercial growers purchase pathogen-tested planting material every year, a measure that has almost doubled marketable yield per hectare. The pathogen testing scheme is reinforced by industry supported research into virus (and other disease) diagnostics and management, as well as enhancing effective distribution and multiplication of clean planting material. The sweetpotato industry became a signatory to the Emergency Plant Pest Response Deed in late 2017 and has started to develop a national biosecurity plan. The high priority pests of sweet potato have yet to be determined. They are usually identified during the development of an industry biosecurity plan, which the Australian Sweet Potatoes Growers Inc. is in the process of doing.